♦ So far, links to Cassini and Galileo image galleries offered by NASA/JPL are presented here. ◊ Auf dieser Seite finden Sie Weblinks zu Bildgalerien von Cassini und Galileo, die von NASA/JPL angeboten werden (in englischer Sprache). The header image of this page shows Saturn’s mid-sized icy moons. From left to right: Mimas, Enceladus, Tethys, Dione, Rhea, Iapetus. The moons are not displayed to scale; their diameters actually vary from ∼400 km (Mimas) to >1500 km (Rhea). They are all more or less spherical in shape; some appear as half or gibbous moons here because of the illumination conditions during the observation. ♦ PDS Image Atlas — the world’s public source for all Cassini mission raw images and all Galileo mission raw images. ♦ Planetary Photojournal — likely the source for processed Cassini and Galileo image products. ♦ Top 10s — the Cassini Project’s top-ten featured images from 2011 to 2017. ♦ I had the privilege to design and command the last 76 images of the Cassini mission. 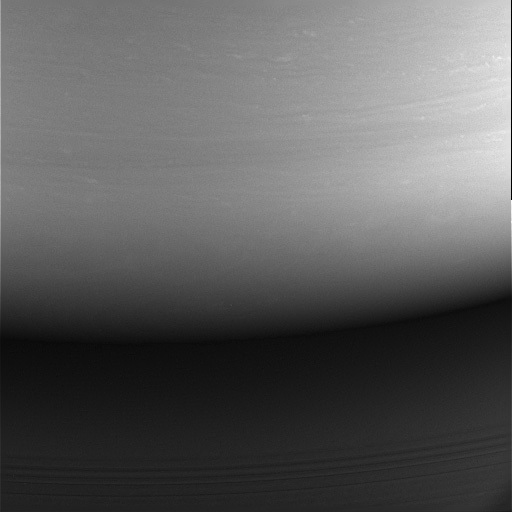 The image to the left shows the very final WAC image of Cassini, taken at 2017-257T19:59:03.985 UTC/SCET (image mid-time) as part of a 1×3 mosaic. Some technical details: Image-ID: W1884114531 (Wide-angle camera WAC); clear filter, 180 ms exposure; image size: 512×512 pixels; field-of-view: 3.5°×3.5°; CCD gain: 29e−/DN; data encoding: 12-bit. The version of the image shown here is a .jpg file which has been calibrated with the ISS calibration software (CISSCAL) and slightly contrast-enhanced, plus rotated by 180° so that north is up. In the upper part, the atmosphere of Saturn is visible, illuminated by the rings. The lower part shows the inner parts of the rings, illuminated by the light reflected back from the planet. The impact site of Cassini is located somewhere in the upper left part of the frame. This image was also presented as the “Astronomy Picture of the Day” on 16 Sep 2017, the day after the Cassini plunge.